**** Chosen by Winner: James D.
The Perfect Tool for Gutting and Skinning. A collaboration between Glenn Klecker and David Kurt, a lifelong hunter and custom knife maker. 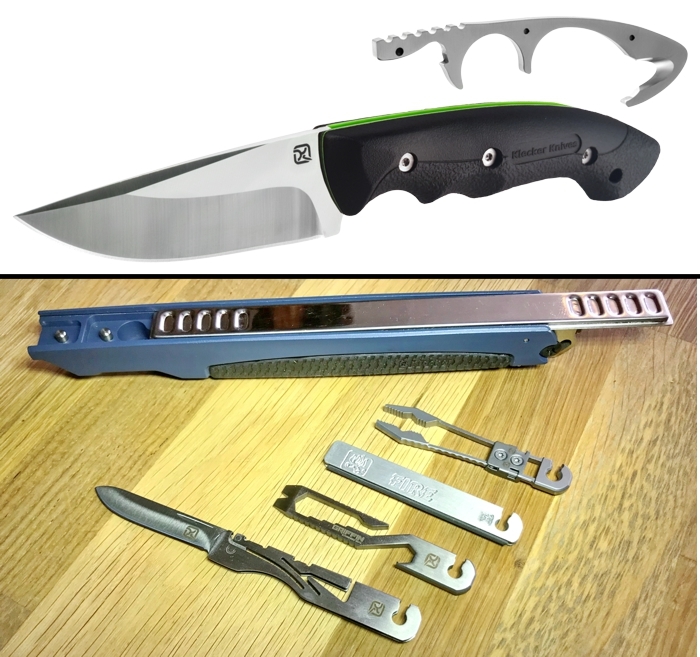 This lightweight drop point, all around hunting knife is simple to pack but designed to get the big jobs done. The Glass Filled Nylon handle and thumb jimping are comfortable and have easy to grip finger notches that keep it in place, even when the cutting is wet and slippery. A full-size removable gut hook and bottle opener are concealed in the handle, perfect for gutting, skinning and popping the top off of a cold one. From skinning to quartering, the 3.97-inch fine edge blade is designed for smooth engagement and firm cutting. With space for 3 additional, (4 spaces total) KDC tools your options are limitless. You can create a hygiene kit. survival kit, camping kit or even a cleaning kit.